Delux Villa gets great reviews and has a perfect pool. You won’t want to sight-see when you’ve got Delux Villa’s pool to come back to. 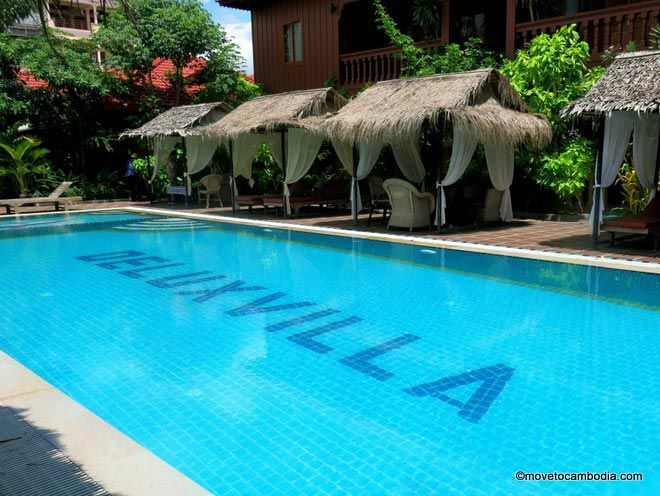 Delux Villa is a lovely, family-run resort in central Battambang with some of the best reviews in town. The good reviews are deserved: the staff is friendly, the pool is immaculate, and the rooms are well-equipped. And they believe in recycling: they’ve stolen all of the text of their website from that of Siem Reap’s 5-star Amansara Hotel (and forgot to change the name on their site). While the Delux Villa isn’t quite up to Amansara standards, their prices compare favorably at between $50 and $150 per night (versus Amansara’s starting rate of $1000). So forgive them their web trespasses, because it’s a pretty sweet hotel. Keepin’ it delux at Delux Villa. They’ve got two types of rooms, standard and lux. The price difference is minimal, $5 or $10, but the lux rooms are substantially nicer, with brighter rooms, more appealing decor and additional seating. All lux rooms also have a terrace or pool-view balcony with seating. All rooms, both standard and lux, have the largest LCD TVs I’ve seen in any hotel in Cambodia, as well as refrigerators, safes, air-conditioning, writing desks and hair-dryers. They also have a mini-bar, but oddly they keep the offerings in a basket outside of the refrigerator, so unless you like warm drinks, bring your own in from outside. The bathrooms are massive, with high-end showers and brand-new fittings. Breakfast is included, and although it’s not particularly exciting, you’ll get a plate of fresh tropical fruit each morning as well as when you check in. The pool is the best part, though, surrounded by shaded and unshaded sun loungers and, at night, illuminated by multi-colored lights. 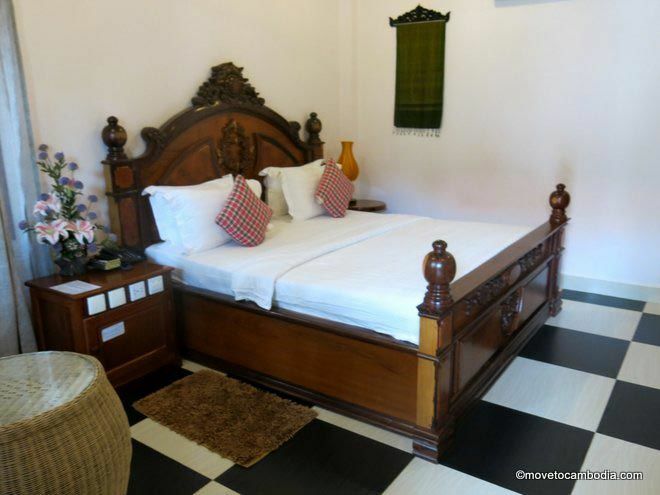 In fact, it’s so appealing that if you stay at Delux Villa you may never want to go out and explore Battambang. Rooms on Agoda are always lower than on the Delux Villa website. In low season, however, if you’re willing to take your chances, you can sometimes beat the Agoda rate by walking in and negotiating directly with the hotel. 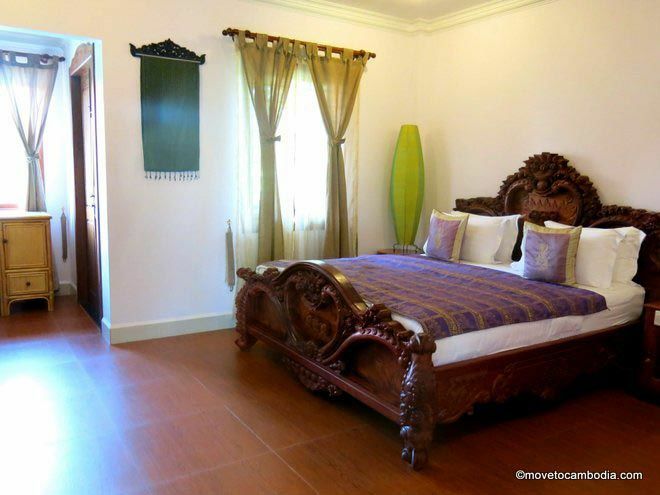 Check Delux Villa prices on Agoda now.